Alberto kindly sent me his Fluidos files which I have loaded in Carrara Extensions but problem still occurs when I run sim - ie . "Error - File cant load fluidsim.dll file. I even tried the AMD version of fluidsim.dll - just in case . Now await further guidance from Him up above ! or any one down below. At least this gives me plenty of time to read the manual !!! I don't have a problem with objects being ignored, but I've got a terrain made up from multiple pieces, and no matter how well I intersect them, it still seems to find places to leak out. In the end I had to extrude one piece into a continuous channel. Only then would it fill with water! Maybe the intersections are so thin that they are smaller than the cell size, as Phil said. Bearing in mind Alberto's comments I ran the Intel support assistance which did identify a needed update for Intel graphics so did that. Have no Antvirus installed and have turned off Windows Firewall. Ran Carrara as Administrator but still getting dll error. Other programs installed have not previously interfered with Carrara or other plugins. I imagine KBOOM is following this discussion so wonder if he is still experiencing problem. ? Reading through the manual and eager to try out more stuff! 007 try to install the intel cpu opencl drivers too. Give me a screenshot of gpu caps opencl and gpu pages. I am guessing your intel/nvidia combo may interfere. I have a few random apps problems like this on my laptop, when both intel+nvidia gpus are enabled, but no issues when only nvidia is enabled. 2 GPUs of the same brand are problematic, 2 GPUs of different brands are a nightmare. I creat a few cubes and scaled them to serve as a floor and walls. Have angled the walls and rotated the floor and walls as a group so water should flow toward a narrow opening. I then put a curved cylinder at that opening. Added thickness to all of the objects. When I run the simulation it works reasonably well, except that some of the water goes into the curved cylinder and pierces straight through the opposite side. Other parts of water follow the curve as intended. Any suggestions as to parameters to play with? The cell size is big, I guess, Try a smaller one. Thank you so much for this great plug-in,. ,. and thanks to PhilW for the great example video's. Is there a way to have multiple "Fluid domains" interacting, EG: oil and water, or ...raspberry ripple ice cream swirls. Would it be possible to create a VDB export option for the final meshes which would allow us to import the results (via Octane) as VDB animated sequences, which could have individual shader options. @Alberto - thanks for this fantastic plugin. Smaller mesh size fixed my leaky pipe and kept water going in right direction. In a simple simulation, two sources shares the same geometric object. The simulation visualizer, e.g. the object with the FluidS modifier has as default one shader; you can change this manually, but I think it's a very tedious work. However, there are better ways; i.e., if you have two sources, you could simulate first the one and then the other in two separated bakefiles. Next, you should put two visualizer in the scene, each one connected with its own bakefile system. So each visualizer could have its own shader, they could use the transparency channel to mix colors. I think there are some other tricks to get similar results. About the second question. It its possible, to some extent, to get two or more fluid simulations interacting. Run the first fluid simulation, then enable the visualizer. Set up the second fluid simulation with the visualizer of the first one inside the Fluid Domain (geometry and hierarchy) as an other solid obstacle. The second simulation will interact with the results of the first. If you wish, the first simulation could be reran to get more interaction. You could put temporal solid obstacles and forces to get more mixing. It is an iterative process. About the third question. : no, by now. But I'm curious about VDB, I'm looking at it for some time now. I didn't forget you. I'm already thinking. However, can say that graphics is Intel except on software I nominate in the Nvidea Control Panel and Carrara is set for NVidea. That is So Cool! Not just the waterfall, but the whole scene just looks marvelous! Bravo, Sir!!! Is Fluidos the waterfall only or also the river? 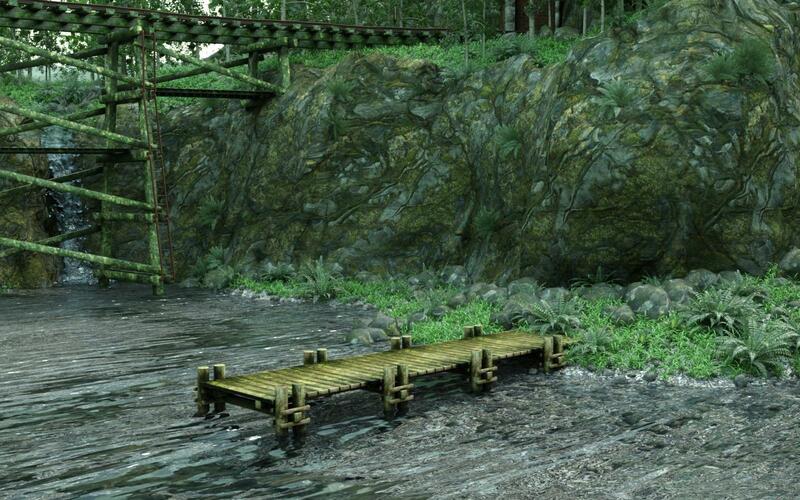 What kind of texture are you use for the river? (personally, I prefer a glass texture rather a water texture). What steps have to be taken to use/activate a Fluid Source of Sink? then ran the simulation, added a second fluid domain to visualize - but didn't see any fluid generated. That sounds like the right steps - did you ensure that the Fluid Source was inside the volume of the Fluid Domain? That's the only thing I can think of off the top of my head. @PhilW - thanks for confirming steps; silly mistake on my part - I didn't adjust completion from 1-100% on FluidS modifier for second Fluid Domain. I switched to Mac, and have setup xcode, I need to download the sdk and try compiling. If I get it figured out I can see about helping to compile on mac. Compiling a Carrara extension is not very complex. The problem here will be more about compiling the different DLL of the simulation library.